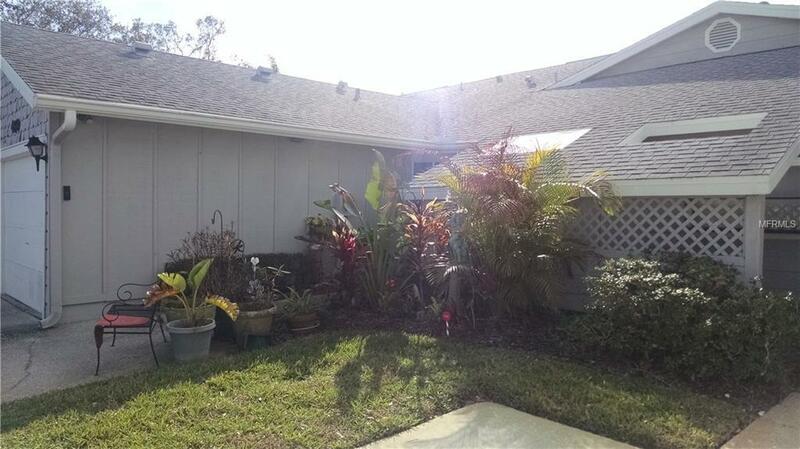 Sought after Palm Harbor villa in Daventry Sq. w/ garage. Vaulted ceilings for an open feeling, new lights and fans. Remodeled kitchen w/ lots of storage and counter space with bar area overlooking dining room. Tiled in living areas,guest bedroom and baths, carpeted master bedroom. Sliding glass doors to glassed-in lanai from both master bedroom and living area to expand your living space. The lanai has a walk out deck in fenced back yard with a new covering to sit and enjoy the sunset. Back gate opens to common area for walking your dog or strolling to the heated pool. Master bath has stack-able washer and dryer with large cabinets to store linens and a walk in closet. The second bedroom in the front has french doors and a hand painted wall mural in the bathroom/w tub. New water heater. Daventry Square a shares park and playground with Wexford Leas.